The Form 471 application window is open, but not for much longer. It will close at 11:59 p.m. EDT on Wednesday, March 27th. To help resolve applicant issues during the final days of the application window, USAC’s Client Service Bureau (“CSB”) will be open for longer hours the last three days — from 8:00 a.m. until 10:00 p.m. EDT on Monday and Tuesday, and from 8:00 a.m. on Wednesday until 12:30 a.m. EDT on Thursday (after the close of the window). Applicants expecting to be filing last-minute applications should first confirm that their EPC passwords are up-to-date. Applicants encountering password reset problems should review the article below before calling CSB. USAC issued Wave 50 for FY 2018 on Friday, March 22nd, for $1.48 million. Cumulative funding as of Wave 50 is $2.18 billion. An applicant forgetting their password can generate a reset message by clicking the “Forgot your password?” link on the sign-in screen. This will generate a return email that includes a hyperlink to an EPC reset website. Depending upon what browser is being used, however, simply clicking on that link may not work. In some cases, it will result in a “401 error – unauthorized user” message. Should this occur, right-click on the link to “Copy Hyperlink,” right-click on the address field of a browser, “Paste” that address into the field, then push the “Enter” key to get to the reset password screen. Important reminder: The EPC password reset link remains active for only 15 minutes. Once the time expires a new link will have to be requested. Last month the FCC released a Notice of Proposed Rulemaking (“NPRM”) and Order (FCC 19-5) extending the suspension of an earlier rule requiring a three-year amortization of special construction charges of $500,000 or more. That requirement had been suspended as of FY 2015, but only for four years. Without FCC action, amortization would have resumed in FY 2019. In addition to suspending the amortization requirement for the coming year, the NPRM called for comments on a proposal to permanently eliminate amortization. Comments, due last Monday, were received from the seven organizations listed below — all supporting the permanent elimination of amortization.1 Reply comments are due April 1st. 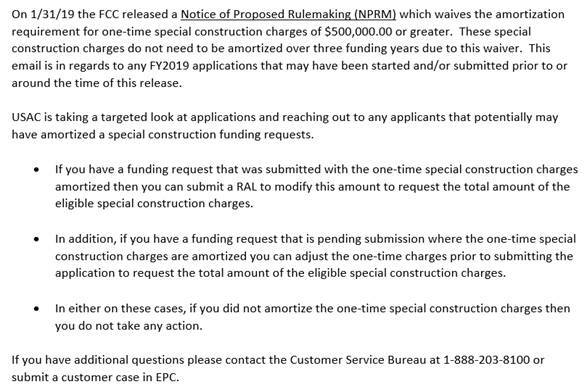 April 1 Deadline for submitting reply comments to the FCC’s NPRM (FCC 19-5) to permanently eliminate the amortization requirement on special construction charges (see article above). Service types featured on the Form 470 and Form 471 must be consistent. Ask CSB to help with entity profile updates not completed during the administrative window. Use the RAL modification process after the Form 471 has been filed to make entity changes that CSB cannot correct. 1 The two service provider filings, while strongly supporting a permanent end to E-rate amortization of special construction, urged the FCC to better coordinate all USF program rules to reduce incentives for overbuilding of existing facilities.